Ever since White Widow entered the cannabis scene back in the mid-90s, the strain has become a staple of Dutch cannabis excellence and quickly became a classic. 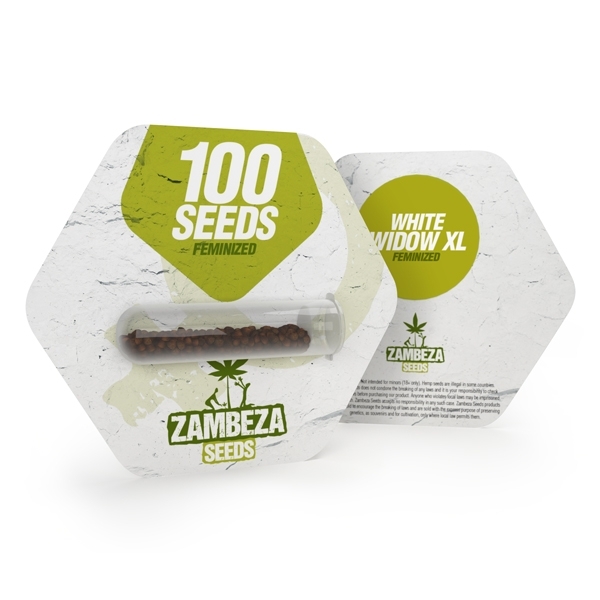 As one of the top Dutch breeders, we at Zambeza deemed it as just logical that we’re honouring her with our XL variant that shines with high yields, a very short flowering time and more excellent qualities that made White Widow so popular. If you’re into smoking some good weed (and who isn’t? ), you will surely know that some of the best strains have their origins in the Netherlands. Famed White Widow is one of these prime examples where Dutch master breeders created a strain that quickly became an enormous commercial success and won many awards, thanks to a plethora of fantastic traits like her potency, productivity and excellent aroma. With our White Widow XL, we’re proud to release a version of White Widow that outperforms many others. Among her outstanding characteristics is her outright crazy production that makes for substantial yields of up to 550-600g/m² in a very short 60 days of flowering. Indoors, the plant reaches 60-90cm which makes it an ideal sized plant that you can grow almost everywhere. Outdoors, expect much bigger plants that can get as tall as 200cm if you just let her. Give her plenty of sun and she can yield a staggering 600g per plant! What also makes White Widow XL special in regards to growing her and a good choice to grow is her excellent genetics that adapted to our European climate so she’ll give stellar results even in less than optimal conditions. White Widow XL makes smoking her a true delight that is hard to resist once you take your first hit. She blends sweet aromas with sour tones with some subtle notes of pungent and spicy flavours for a very pleasant smoke. Her effect is no less remarkable where she gives you a great mix of physical relaxation and calm that’s also uplifting and happy. With 18% of THC, she’s a good smoke for all times of the day although not too overpowering. You can enjoy White Widow XL during the day to give you a boost of creativity and she’s also excellent if you want to chill and relax at night. With our White Widow XL, we’re proud being able to provide a Dutch classic that we’re sure won’t disappoint growers and cannabis connoisseurs alike! This is a hybrid that’s pretty much perfect no matter how you look at her. If you’re a grower who requires a bigger quantity of some prime Dutch goodness, you can get White Widow XL bulk seeds in packs of 100 seeds!